A new, positive-lock type kit. Our adjustable rear toe kit allows you to make toe adjustments for better handling and turn-in. 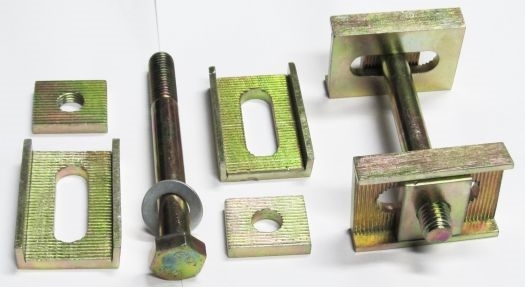 The kit consists of two sets of brackets (left and right) and positive-lock type adjustment hardware. Each step (tooth) allows 1/16" of adjustment, and the total range is over 1.1". Only one wrench is required for adjustment. Kit fits 2002, E9/E12, E30, and the E28/E24 cars. Note: I highly recommend using this kit in conjunction with the Camber Kit. When adjusting the toe on a semi-trailing arm the camber will also be affected. Note: Initial installation requires removal of rear subframe, grinding and welding of brackets to the subframe. These plates are Zinc-plated, this plating should be ground off of the weld-zone prior to welding.